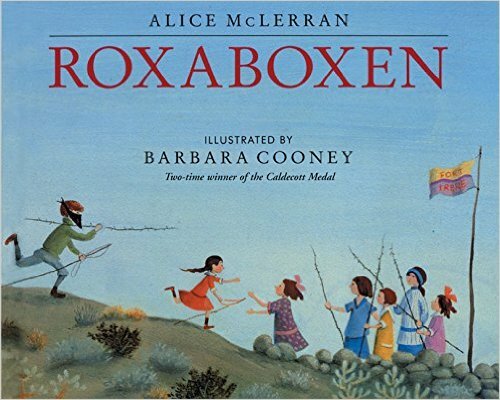 Storyline: Roxaboxen is the name of a play town that some children built out of old wooden boxes, stones, pebbles and sticks. At first, Marian found some wooden boxes just across her street. Then, when other kids joined, they dug up other boxes that they filled it with pebbles pretending to be buried treasures. The first one to make a house was Charles. Soon others followed. They traced streets out of pebbles and rocks, they made stores and shops out of wooden boxes, and even a town hall. They made a jail where they put the speedy drivers and a cemetery for a dead lizard. They made forts and played war: girls scouts versus the bandits. Overall they had a lot of fun. As they grew up, other kids came to play in Roxaboxen. And even when they left the real town they never forgot the place they used to play. This story is very nostalgic. But aside of that, it’s value today lays in the fact that it shows that we can use our imagination for wonderful things. … (imagination is better than any app). Characters: Marian, Charles, Frances, Jean, Anna May, Eleanor. Illustration: Barbara Cooney does a wonderful job illustrating this story. Her drawings are realistic and detailed. The children’s clothing reflects a the 40s and maybe 50s. The colors are earthy and soft.